If you have ever created promotional work such as brochures or websites, you have probably contemplated how to secure photographs for these purposes in the most efficient and cost effective way. I recently sat down with a professional photographer to discuss my experiences designing marketing collateral for restaurants. Often, I will ask to see pictures to insert in the menu, only to find that the business doesn’t have any. The client will sometimes ask me to obtain some sort of stock photo and it’s here that I often find myself redirecting the client to hiring photographer. The issue is that stock photos often don’t fully represent the item the restaurant is serving. This is particularly important in an age where concerns have risen about the truthfulness of restaurant advertising. Restaurants such as McDonalds and Taco Bell have been sued for false advertising in the previous years. In 2002, McDonalds was sued for misleading the public into thinking their French Fries were fried in vegetable oil, when in reality they were using beef broth. Additionally, Taco Bell has been guilty of misrepresenting the amount of beef in their product. Imagine coming into a restaurant with an idea in your head: you’re looking for a Tornado-room quality, 100% Angus filet mignon, cooked to a perfect medium rare. You see a picture of this fantasy steak on the menu; it looks juicy, tender, and appetizing. You order it, no questions asked. However, when it is served, it’s nothing like the picture. You reluctantly chew the slab of meat in front of you, leave disappointed and probably won’t return. This is the potential risk restaurants run into when using stock photography. I may be able to find a suitable stock image for $25 to $100 and avoid the charges with custom photography, but the problem with stock photography is that these images tend to be more general. Since stock images are available to many people, I run the risk that the selected image may have already been used for another restaurants’ promotional work. Obtaining a specific brand identity is vital to any business, and distinct, unique photographs can help attain this goal. 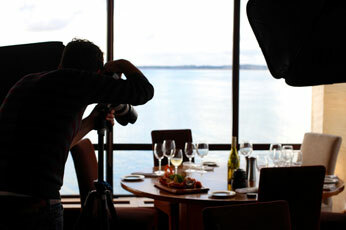 After I’ve convinced the restaurant of the potential setbacks of stock photography, we are brought to the next question: should the client take pictures themselves or hire a photographer? Depending on the images, a professional photographer can cost anywhere between $400 and $1000. I can do my own shots, but it may sacrifice the quality the client is looking for as I am not as well versed in lighting, angles, and lenses. Which options should you use? If you are going to use a stock photo, you may want to be cautious on how you want to present your food image to consumers without deceiving them. However, if your picture needs to communicate an exact product or place, then custom photography is the way to go. While this option is the more expensive of the two, choosing a professional photographer will reduce your risks and increase your return on your investment. With these custom photographs on your marketing collateral, your customers will see what you and your brand are all about. Consider the whole picture when designing your marketing collateral.